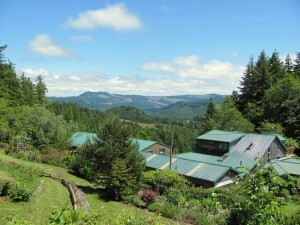 We are a group lodging facility located 12 miles south of the small coastal port and vacation town of Bandon, Oregon. Although only four miles inland, a brisk leap in altitude (circa 1200 feet) finds Highland Woods Group Getaway (formerly Langlois Mountain Retreat), nestled among evergreens and encircled by views encompassing the ocean to the west and miles of even higher peaks and ranges to the east. If you enjoy state parks but prefer more comfortable private accommodations without the crowds and noise, this might be the place for you. The lodgings are surrounded by terraced gardens – think tea and croquet – grading up into forest trails and grass-covered foot-friendly hilltop acreage. Numerous outdoor gathering spaces invite al fresco happenings, including (but certainly not limited to) dining under the stars, badminton with the kids, napping under the wisteria, or coffee nicely flavored with sunrise over the mountains. As for entertainments and pleasant destinations close by, a twelve-minute drive brings one to Floras Lake for prime windsurfing conditions and short walks to the beach. Also in the vicinity are Cape Blanco and Bandon State Parks where opportunities for kayaking, beach walks, horseback riding, and lighthouse visiting await. In addition to a wide range of choices in fishing and golf the area offers excellent opportunities for seasonal U-pick local organic fruit. Available for yoga/meditation retreats, family gatherings, workshops, weddings (to which additional use fees apply), and seminars, our site is particularly well-suited for those who like being outdoors. Also a great for place for old friends to catch up, and if your group’s numbers are on the small side, lower rates can be had while still providing you with room to spread out and enjoy the feeling of having your own private state park. To see what we offer check out the basic getaway pricing tab for current rates and room descriptions. If you would like more information or are interested in booking, please use the contact us button to provide your information and we’ll be in touch.